Enter the personalization you would like, (ie. 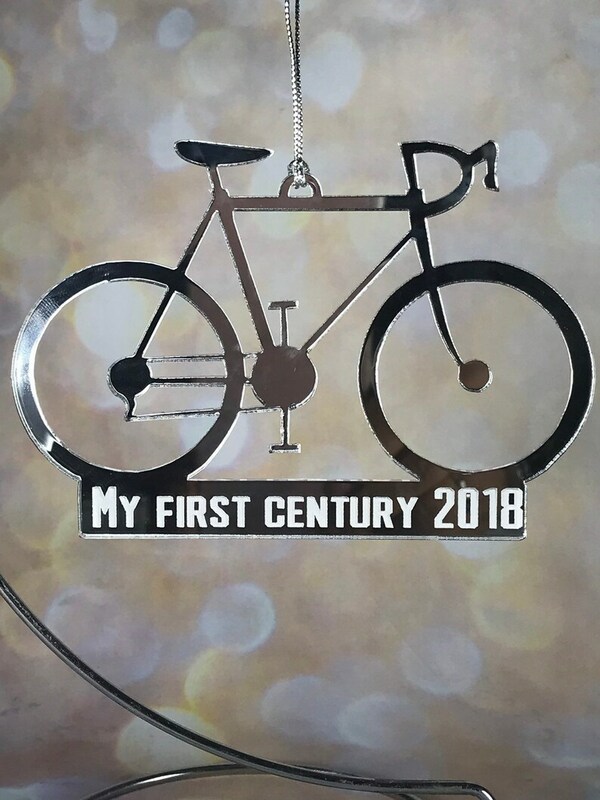 My First Century 2018, Shut Up Legs!, Cyclist's Name, Bike's Name, or any phrase up to 21 characters. This is a great Christmas gift for your favorite cycling enthusiast! Great for cyclists that have finished their first century ride this year or love the phrase, “Shut Up Legs!” I can personalize it with your bike’s name, the cyclist’s name, or just about any phrase you would like (up to 21 characters)! 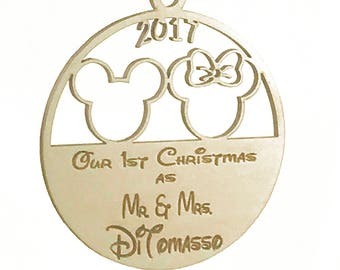 This ornament is designed by me & machine laser cut from mirrored acrylic. Your choice of silver or gold mirrored acrylic. Awesome! I Was Very pleased. The hanger is beautiful - exactly as ordered - and the bride, my daughter, loves it. As far as shipping goes - I received a message from the seller on 3/20/19 that this hanger would ship by 3/23/19. When I hadn't received it by the morning of 4/3/19, I messaged the seller. Later that afternoon I received an update that the hanger had just been shipped - and it was shipped priority mail. I would suggest that if you get a message saying that the item will ship on a certain date to contact the seller the next day to make sure that it did ship. 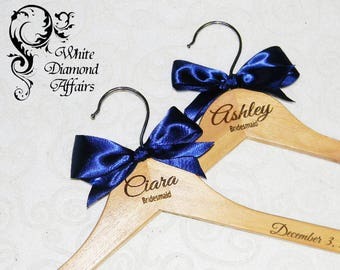 Also, we ordered the hanger in plenty of time for the wedding, so I would suggest ordering in plenty of time. Ms.lynne has been very helpful and respond to all my questions. The product arrived as she had promised. My guest for the wedding all loved it! The quality of the guest book was beautiful. Definitely will order from her again. Disney Castle Wedding Guest Book Drop Box, Personalized Wedding Guest Book, Wedding Guestbook, Domestic shipping FREE - Limited Time Only! We accept credit cards, Etsy gift cards, and Paypal as the payment method. All items are carefully packaged. If you'd like to purchase insurance, please let me know. Insurance will be an additional cost (whatever it calculates to by USPS for the purchase price of the hanger). Due to the custom nature of personalized items, we cannot give refunds or exchanges. Personalized items that are found to have been our mistake, will be replaced at no additional charge. If after ordering a non-personalized item, and wish to cancel order, buyer is subject to a 20% cancellation fee. If customer is unsatisfied with a non-personalized purchase, customer has 24 hours from the delivered date of the item to contact me, and 7 days to return non-personalized item for a full refund, less shipping and handling fees. PLEASE MAKE SURE YOUR ADDRESS IS CORRECT ON YOUR ETSY ACCOUNT! We will only ship to the address you have on account. We will not change your address for you!!! PLEASE DISREGARD AUTOMATED SHIPPING DATES THAT ETSY ATTACHES TO THE ORDER because items are shipped to arrive by the "Need By Date" you have given me during cart checkout. We are currently shipping items within 21-28 business days of your cleared payment, unless it is a custom or large order. We ship all orders Priority Mail through USPS. If expedited shipping is needed, please convo or email us before placing your order and we will be happy to accommodate you. Shipping insurance is available for purchase. Prior to ordering, please convo us to make arrangements for insuring your purchase. We will not responsible for lost or damaged packages in transit. During the busy wedding season, I operate by need by date. This means that orders ship by need by date, which is why I ask for this information at the time of ordering. This ensures that everyone gets their order on time. On occasion, I may close the shop down to keep up with the demand, but ensure that orders arrive on time! When customer has been informed of need by date policy and then opens a case for non-receipt and need by date has not yet arrived, a refund will be promptly issued. I forgot to change my address on my account, can you change it for me? Unfortunately, we only ship to the address on account. We will not change your address for you. Please make sure your address is correct before ordering.